India 330-4 (Virat Kohli 183, Rohit Sharma 68, Umar Gul 2-65) beat Pakistan (329-6, Nasir Jamshed 112, Mohammad Hafeez 105, Praveen Kumar and Ashok Dinda, two wickets each) by 6 wickets. 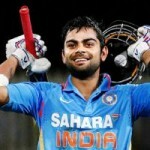 Virat Kohli murdered the Pakistani bowling attack by smashing his career best 183 runs as India won the important match by six wickets in the Asia Cup 2012. A lot of thrill across sub continent, especially in Pakistan and India was witnessed where lot of enthusiasm among the public was obvious. Big screens were installed at quite a few places in different cities of the neighbour countries and both teams had enough support at the stadium. Pakistan piled up 329 with four wickets still in hand at the end of the metered 50 overs which was overtaken by India who thrashed 330 runs for the loss of just four wickets in 47.5 overs. 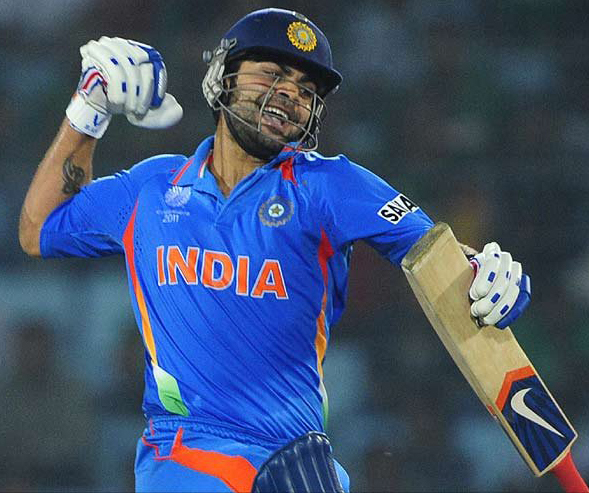 Kohli Was declared ‘Player of the match’ for his magnificent knock of 183 off 148 balls which was the highest score against Pakistan by any batsman. The fifth match of the Asia Cup 2012 was played at Shere Bangla National Stadium, Mirpur, on March 18, 2012. Earlier, Misbah-Ul-Haq won the toss and opted to bat without hesitation as MS Dhoni described that he could have gone for fielding as well after winning with the coin. Pakistan opened the innings with their emerging duo of Mohammad Hafeez and Nasir Jamshed who have done well in the tournament so far. They started off well as Nasir dispatched three fours in the third over off Praveen Kumar and the consolidation job was carried on without any risk. The first fifty of the innings was completed in the 10th over as Dhoni made few bowling changes to break the partnership but no chances were offered by the batsmen. Both batsmen were chasing each other and completed their fifties in the 18th over which brought first hundred on board for the Green Shirts as well. They broke the previous opening record against India which was previously held by Saeed Anwar and Aamir Sohail who scored 144 runs at The Padang, Singapore on April 5, 1996. Nasir got a life when Sachin Tendulkar dropped a return catch of his own bowling at 69. Hafeez smashed his fourth century on the first ball of the 33rd over and Nasir Jamshed achieved his maiden ton in the 35th over. The batting powerplay was taken in the 36th over which brought the first success for India when Nasir skied a ball and Irfan Pathan caught him at short third man off Ravichandran Ashwin for well crafted innings of 112 from 104 balls with one six and 10 fours. Mohammad Hafeez followed him in the next over after thrashing 105 off 113 deliveries which included one six and 9 fours. Younis Khan played a hurried knock of 52 after facing 34 balls which comprised 6 fours as Pakistan amassed 329 runs for the loss of six wickets at the end of the 50th over. Praveen Kumar and Ashok Dinda were the major strikers with two wickets each as Irfan Pathan and Ashwin claimed one wicket. The Blue Shirts had a horrible start when Gautam Gambhir was declared leg before wicket on the second ball of the first over off Mohammad Hafeez without a run on the board. The young gun of India, Vitrat Kohli appeared on the scene, joined in with Sachin Tendulkar and both of them took the team out of initial crises. The duo was severe on the quick bowlers and negotiated the spinners at merit while the required run rate was kept in check. The boundaries kept on flowing from the blades of the two as Kohli was the first one to score his fifty on the last ball of the 16th over and Tendulkar joined him in the next. Pakistan got the second breakthrough when Tendulkar was unable to read the ‘Doosra’ from Saeed Ajmal and was caught in the first slip by Younis for 52 off 48 balls with one six and five fours. Rohit Sharma replaced Tendulkar as Kohli kept on hammering the rival attack at will and powered his 11th ODI ton on the second ball of the 30th over. The young lions of India kept on cruising by utilising all scoring chances and the rival bowling attack looked ordinary. They required 115 runs to win at the end of the 35th over as the batting powerplay was awarded and the five overs were utilised to the best of talent by the batsmen. Sharma added another fifty to his records on the fourth ball of the 39th over and the acceleration was continued by the two. They shared a mammoth partnership of 172 runs for the third wicket before Rohit Sharma was caught by Shahid Afridi off Umar Gul for 68 off 83 with one six and five fours. The third wicket was lost at 305 runs and 13 runs later Kohli was gone while going for a big hit for a majestic 183 off just 148 balls which comprised one six and 22 fours. India achieved the target when Dhoni dispatched the winning four on the fifth ball of the 48th over. They hammered 330 runs for the loss of just four wickets with 13 deliveries to spare. Umar Gul was the highest wicket taker with two as Mohammad Hafeez and Saeed Ajmal shared one each. India has grasped the second spot after winning the match, has attained 8 points and the match between Sri Lanka and Bangladesh on March 20th will decide the fate of the finalist against Pakistan. Only if he could hit more sixes, he would be a perfect replacement for Yuvraj Singh. Good to have a stable batsman in the top order.